The Green Girl hopes everyone had the opportunity to honor our planet for Earth Day. I decided to take part in my employer's Village Green program by applying to become a Green Champion for my office, the CasITa. 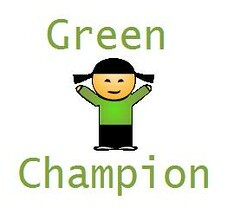 As the Green Champion, it's my job to encourage my office to be as green as possible. The Village Green group is tracking our power consumption and the office with the most significant reduction will assume the title of 'Greenest Facility'. I sent out an email with some conservation tips and asked for additional suggestions. The CasITa now turns on only half the ceiling lights. When I see empty offices, I make an effort to switch off the lights. We recycle our toner cartridges and the company gave each employee a mug to minimize paper cup usage. I need to continue to identify ways our office can reduce our carbon footprint. Only use 4 squares per 'time' . Single ply. Great job on taking care of earth! I believe that every little thing we do makes a difference! Great Job!